NETWORK FINALS: THE GOOD WIFE series finale gained 0.1 in final numbers, but ONCE UPON A TIME and THE CARMICHAEL SHOW fell 0.1. CABLE HIGHLIGHTS: HBO continues to ride high with GAME OF THRONES, up 0.03 to 3.70. As to the rest of the line-up, SILICON VALLEY ticked down to 0.91, VEEP slipped 0.03 to 0.44, and LAST WEEK TONIGHT was up a tick to 0.60. (t’s worth noting that LAST WEEK is getting ratings roughly double those of THE DAILY SHOW even though, yes, it’s in only one-third of of US households.) 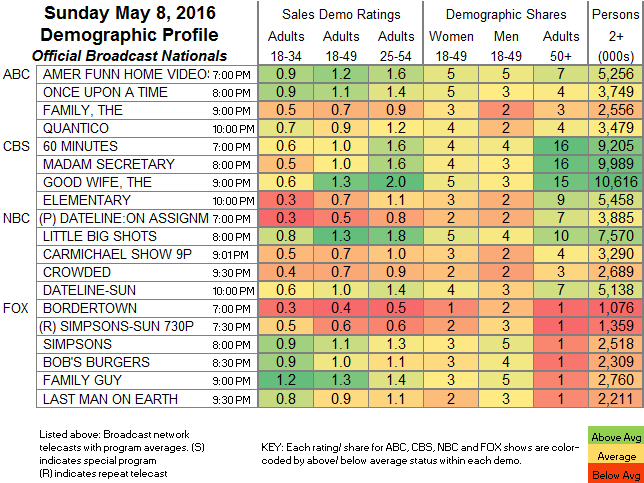 On AMC, FEAR THE WALKING DEAD fell 0.18 to 1.97, and TALKING DEAD was down 0.03 to 0.69. On Showtime, HOUSE OF LIES lost a hundredth to 0.13, DICE didn’t even make the chart, down 0.01 to 0.04/155K, and PENNY DREADFUL managed to edge up 0.02 to 0.20. Starz’s THE GIRLFRIEND EXPERIENCE held at 0.05. Adult Swim’s ROBOT CHICKEN was steady at 0.69, and MIKE TYSON MYSTERIES was down 0.02 to 0.60, with MR PICKLES down 0.04 to 0.49. USA’s MOTIVE rose 0.05 to 0.27. In the unscripted realm, TNT’s NBA PLAYOFFS game was at 2.05, above everything but GAME OF THRONES. VH1 aired an episode of LOVE & HIP-HOP ATLANTA at 0.89, using it as the lead-in to DEAR MAMA at 0.43. On E!, KEEPING UP WITH THE KARDASHIANS dropped a steep three-tenths from last week’s season premiere to 0.75, and RICH KIDS OF BEVERLY HILLS fell 0.16 to 0.27. (Note that some of the female-skewing shows of the night may have been affected by Mother’s Day.) 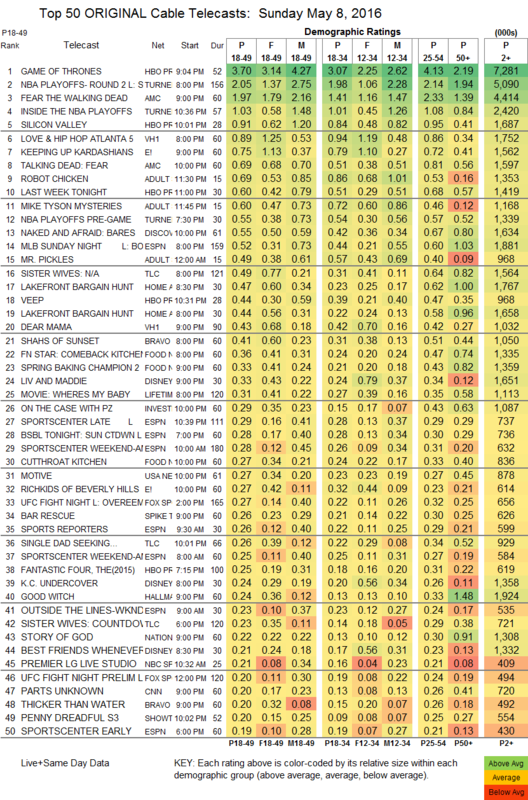 On Discovery, a NAKED & AFRAID special was at 0.55, compared to last week’s 0.84 for a regular episode. TLC’s SISTER WIVES returned at 0.49, with SINGLE DAD SEEKING at 0.26. On Bravo, SHAHS OF SUNSET fell 0.15 to 0.41, and THICKER THAN WATER was down 0.12 to 0.20. On Food Network, FN STAR returned at 0.36, SPRING BAKING CHAMPIONSHIP lost 0.05 to 0.33, and CUTTHROAT KITCHEN was down 0.07 to 0.27. On Spike, BAR RESCUE fell 0.21 to 0.26, and LIFE OR DEBT was down 0.11 to 0.15. Hallmark’s GOOD WITCH ticked down to 0.24. Nat Geo’s STORY OF GOD finished its run with a 0.14 drop to 0.22.